T-max 500 4t lc inject (from 2008). T-max 500 4t lc inject. Finally the transmission for yamaha t max is complete: from now on the kit over range is on sale! Indeed the components that must be assembled together to obtain the best performance in competition are now available under the same code and at a lower price. This new system is centered on the new torque driver (mobile pulley) whose diameter is major and technological characteristics quite at the forefront. The larger diameter of this pulley allows a range of the major transmission ratio compared to the original pulley whose outer diameter is slightly lower. Malossi technicians have also taken great care in producing this pulley, using special materials and a special type of thermochemical treatment that ensures a very high resistance to wear and abrasion, as well as considerable superficial hardness. This new mobile pulley was made to have a perfect functioning if it is coupled to the components of the over range system. To fully exploit the range of the new torque control group and the power available today on competition vehicles, the new malossi x kevlar belt has been introduced, in order to ensure the maximum efficiency in all operating conditions. To complete the renewal of the transmission system and to exploit all the technical characteristics of an exceptional character, malossi also refined the multivar mhr variator. This new variator is the evolution of previous generations, born from the deep experience gained on the competition circuits, and the cad-cam technology available today, which allows to obtain technical results worthy of the highest levels. In addition to the multivar mhr comes the new semi-fixed pulley ventilvar for yamaha t-max, worked with diamonds on the surface ofexcursions of the belt and with recalculated langle to later increase the range of change. The new twist controller, provided exclusively in lover range, completes the over range system! And other pieces available on. Anti-theft devices, batteries, spark plugs, chain kits, pinions, crowns, chains, clutch discs, air filters, oil filters, fuel filters, oils, engine gaskets, spinnaker gaskets, brake levers and clutch handles, grip pads, gear jaws brake, fixed and floating brake discs, brake pads, motorcycle tires, cross and enduro tires, scooter tires, quad tires, inner tubes, lamps and spotlights, wheel bearings and steering bearings, spraychain, turn signals, mirrors, tubes forks, cables, tank caps, handlebars, saddles, screwdrivers, handlebars, valves and stoppers, contactors, workshop saddles, footrests, belts, exhausts, tools, top cases and windshields. Helmets, rain gear, clothing and anti-cold accessories, tire cover, etc. 03.25.55.74.71 Monday to Friday from 9h-12h to 14h-19h. 06.62.69.50.19 from 9h to 20h / Monday-Saturday. 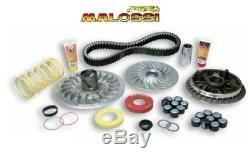 The item "kit over range mhr malossi yamaha tmax t-max 2008/2011" is on sale since Wednesday, February 16, 2011. It is in the category "auto, motorcycle parts, accessories \ motorcycle parts \ other". The seller is "destocnet" and is located in / in villejuif. This item can be shipped to the following country: europe.